After a brief trip to New York, where Prada’s 2019 Cruise show took place, Mrs P is back in Milan for SS19 menswear. This time around, we’ve left behind the old factory (next to the Fondazione Prada) of AW18, and landed at the Via Fogazzaro 36 in the heart of the city. Here’s what went down. ...but they were less The Gadget Shop circa Y2K and more futuristic 1960s-chic: a unique and exclusive re-edition of pioneering Danish designer Verner Panton’s distinctive creation. The cubes sat in the neat grid format that had been mapped out on the floor of the mall (which, according to the show notes, alluded to the geographic coordinates of faraway places), giving the guests the feeling they were floating on air. As the first few models stepped out on to the catwalk to the strains of Aphex Twin’s “Windowlicker”, there was one overarching theme running through the looks: each of them was finished with a nylon quilted iteration of a Russian-style trapper hat, first seen as part of the resort show. No matter that this is a collection designed for the summer, Miuccia seemingly wants us in these for SS19 whatever the weather – and, of course, whatever she says goes. The collection itself was made up of a series of tailored jackets presented in characteristically Prada-esque hues (some which were very AW17 menswear), layered over long-sleeved tops bearing trippy, almost psychedelic prints recalling SS17 womenswear. 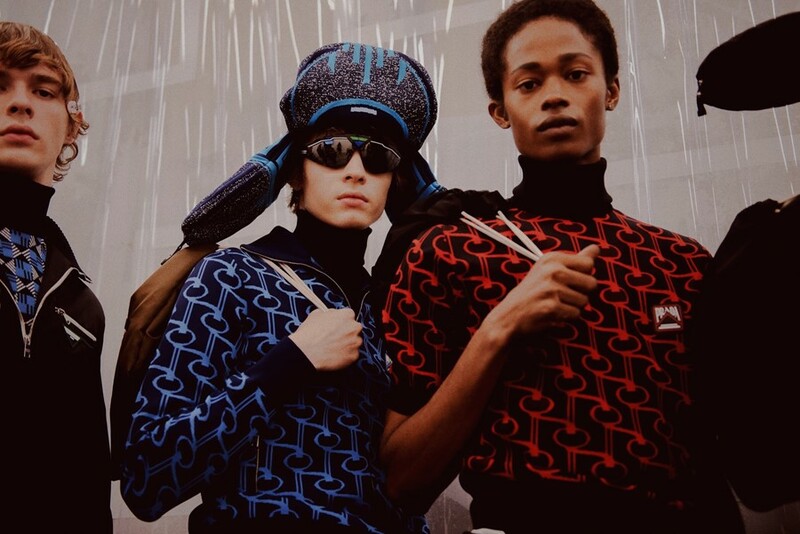 There were also nylon sport track tops and panelled 60s-style tennis t-shirts, paired with bootcut trousers in bold red, navy, and bottle green. The pièce de résistance, though, were the barely-there shorts that finished off many of the looks, some presented in stonewashed denim (you heard it! Prada jorts! ), others in 60s-inspired geometric prints. 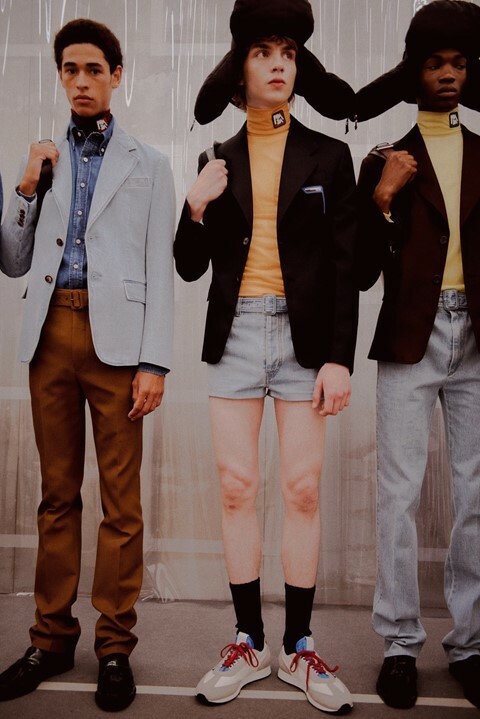 Miuccia described them backstage as being “like mini skirts”, but whatever they are, one thing’s for certain: boys, come SS19, your legs are being liberated. 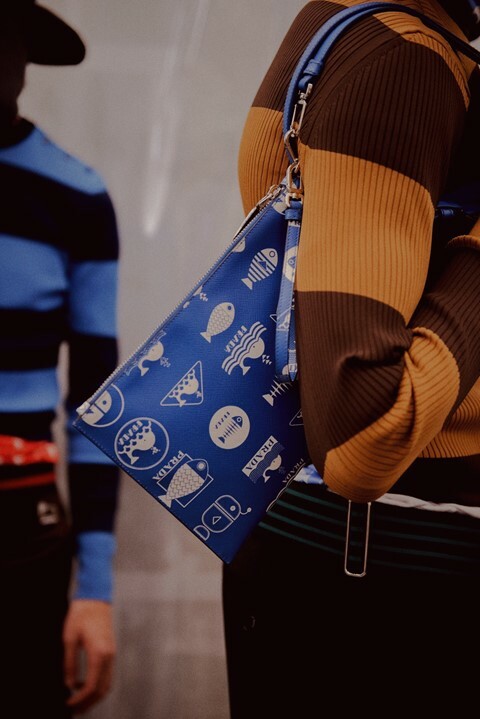 Each of the boys carried a small, buckled man bag or a tiny duffle – some printed with a nautical, Prada fish print – apparently to be slung over your right shoulder only. 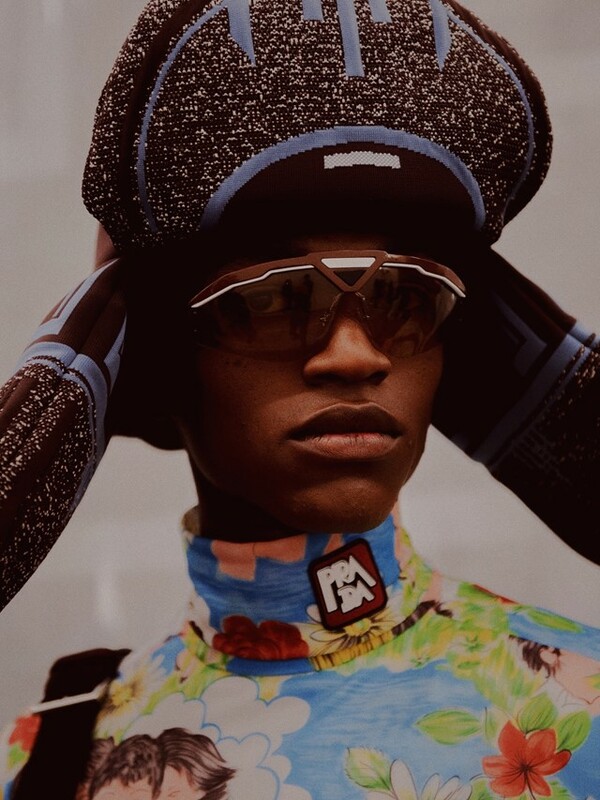 Elsewhere, other accessories seen throughout the collection included Prada Sport-esque sneakers, which made a big and v welcome comeback at last season’s show.